If you are looking to expand your market, adding multiple languages to your website can provide potential customers with access to your products and services. However, creating a multi-language website is not a simple task. A poorly executed website has the ability to hinder your company’s public reputation, so if you are considering offering your services in multiple languages, there are a few things you should keep in mind before you dive right in. Consider the various subdomain options available for your multi-language website. Do some research to determine which option will provide the best search engine optimization (SEO) and satisfy the needs of your growing business. Do you have the capability to address clients in the languages featured on your website? You may want to consider this when hiring or when developing your HR plan. Customers should have the ability to switch between multiple language options with relative ease. Consider placing a drop-down menu with all available language options at the top of each page. Not all languages are written and read from left to right. Ensure the placement of text and images corresponds with the way in which the language is intended to be read. Colours signify different emotions in different cultures. Ensure your chosen colours are appropriate for the message you are trying to convey. Font must also be compatible with every language on your website. To ensure consistency, be sure the font you choose is the appropriate size and contains all characters needed. 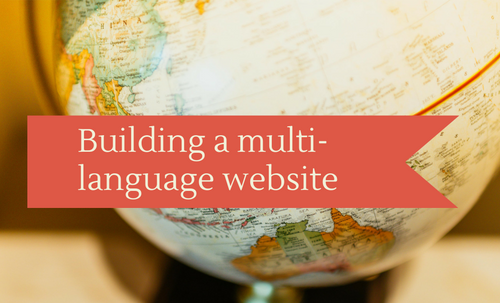 Remember, it takes a lot of hard work to create and maintain a multi-language website. With a bit of strategic planning, a successful multi-language website can be a great way to expand your market and attract new customers to your business. This article was originally published on the Canada Business Network site on November 28, 2016.